A fortnight ago (here), we reported that Edwin Hardeman,[ii] the 2nd of 11,200 claimants to argue that Monsanto-produced herbicide is associated with NHL development, had convinced a San Franciscan jury that Roundup was a ‘substantial factor’ in causing his cancer. The trial immediately proceeded to a 2nd phase, wherein Mr. Hardeman’s legal representatives adduced evidence to support the assertion that Monsanto had attempted to manipulate regulators, scientists, public officials and the general public about the historic safety concerns surrounding its products. Bayer AG’s share price continued to fall to a low of ‎€59.98 on the day after the trial verdict. We previously discussed that a further decline below the €60 mark could leave the company vulnerable to a potential takeover or breakup. 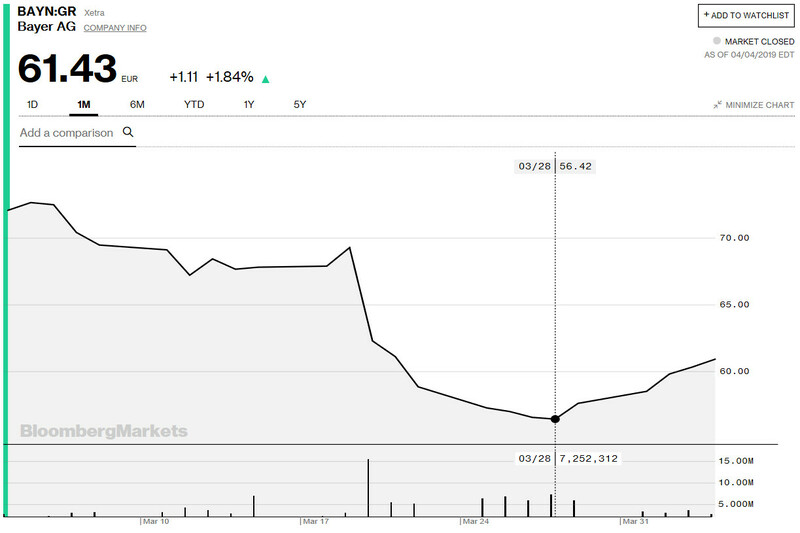 Over the past week, however, Bayer’s Frankfurt- listed stock has shown signs of recovery, as demonstrated by the graph below. Currently, a change of corporate structure would seem unlikely. [i] Yiannis Mouratidis, ‘Monsanto's Roundup Is Losing Ground, But It's Temporary’ (1 April 2019 Forbes) <https://www.forbes.com/sites/yiannismouratidis/2019/04/01/monsantos-roundup-is-losing-ground-but-its-temporary/#72cb700d45bc> accessed 4 April 2019. [ii] In re: Roundup Products Liability Litigation, MDL 2741, U.S. District Court, Northern District of California (San Francisco). [iii] Alexandria Sage and Tina Bellon, ‘U.S. jury says Bayer must pay $80 million to man in Roundup cancer trial’ (27 March 2019 Reuters) <https://uk.reuters.com/article/uk-bayer-glyphosate-lawsuit/u-s-jury-says-bayer-must-pay-81-million-to-man-in-roundup-cancer-trial-idUKKCN1R82N6?feedType=RSS&feedName=topNews> accessed 4 April 2019. [iv] Joel Rosenblatt, Robert Burnson, and Tim Loh, ‘Bayer Keeps Roundup Faith After Losing Second Trial’ (27 March 2019 Bloomberg) https://www.bloomberg.com/news/articles/2019-03-27/bayer-loses-second-trial-over-claims-roundup-causes-cancer> accessed 4 April 2019. [v] Kevin Kelleher, ‘Jury Orders Bayer to Pay $81 Million in Second Trial Claiming Roundup Weedkiller Caused Cancer’ (27 March 2019 Fortune) <http://fortune.com/2019/03/27/bayer-weedkiller-roundup-cancer-trial/> accessed 4 April 2019.